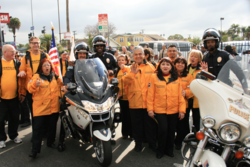 In honor of Martin Luther King Jr. and his legacy, Volunteer Ministers of the Church of Scientology of Inglewood marched on Martin Luther King Jr. Boulevard in Los Angeles January 16, in observation of Martin Luther King Day of Service 2012. Brass bands, cheerleaders, drill teams, gang intervention groups, law enforcement officers and government officials filled the street. And thousands of spectators waived and cheered along the 2.5-mile parade route, barely hearing friends greeting them with “Happy King Day” over the blare of air horns. The 27th annual Kingdom Day Parade honored Dr. King, whose message of freedom and nonviolence inspires people of all faiths, backgrounds and ages. In the spirit of the day—a day of service—at the end of the parade, the Inglewood Scientology Volunteer Ministers welcomed the community to an information booth where they introduced visitors to services available at the new Inglewood Church of Scientology and the Scientology Community Center in South L.A.: free tutoring, one-on-one help, and a wide selection of courses in practical life-skills—from improving job performance to conflict resolution, salvaging marriages and helping a friend or loved one overcome addiction. The Church of Scientology of Inglewood, at 315 South Market Street, is open from 9:30 a.m. to 10:00 p.m. Monday through Friday and 9:30 a.m. to 6:00 p.m. Saturday and Sunday. The Church of Scientology Community Center at 81st and Vermont in South L.A. is open 10:00 a.m. to 9:30 p.m. Monday through Friday and 10:00 a.m. to 6:00 p.m. Saturday and Sunday. For more information on the Church of Scientology and the Scientology Volunteer Ministers visit http://www.Scientology.org. The Scientology Volunteer Minister program was initiated by Scientology Founder L. Ron Hubbard in 1976. There are now hundreds of thousands of people across 185 nations trained in the skills of a Volunteer Minister.